, you'll be able to handle whatever curveballs your lawn throws your way without burning yourself out. 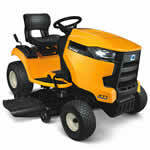 Two important factors to consider when shopping for the perfect lawn tractor are the grade and the size of the tractor. See the comparison chart below to see the differences between an entry-level and mid-grade lawn tractor. Entry-level lawn tractors work best for yards 1-1/2 acres or less. They have lower horsepower, single-cylinder engines which aren't really suited for mowing larger area or for pulling lightweight regularly. Entry-level lawn tractors offer the option of gear-driven (manual) transmissions, which are fine if you have a few obstacles to mow around. A gear-driven transmission tends to be durable and trouble-free but doesn’t offer incremental speed control between the pre-set speeds. Mid-grade lawn tractors offer greater power and versatility. 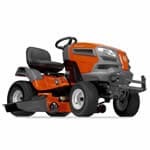 They have twin cylinder engines, which offer more low-end torque and horsepower over a single cylinder engine and are a must if you intend to mow large areas or use any attachments on a regular basis. Mid-grade lawn tractors are designed with hydrostatic transmissions, which offer simple speed adjustments while driving. There are two hydrostatic transmission options: lever or pedal-operated. The pedal-operated option provides the most comfort and flexibility in speed. A hydrostatic transmission is much easier to operate and maintain than a manual transmission, just shift where you want to go and the machine takes you there. After choosing the right grade, selecting the perfect lawn tractor comes down to picking the right mower deck size. Deck size refers to the width of the cut on your tractor. Typically, it's recommended to choose a deck size based on how large your yard or property is. How many acres do you need to mow? The answer to this question will help you decide the correct deck size. Lawn Tractor Buyer's Guide.. Our Power Equipment Direct how-to library can help you learn about How to Fertilize Your Lawn, Vote for Your Favorite Brands in Mower Madness 2019 and Official Mower Madness Contest Rules.